Aquinas’ Second Way is a fundamental part of what we know as the Cosmological Argument for God’s existence and can be found in his Summa Theologica. Everything we can see in the world has one or more efficient causes. It would be impossible for something to be its own efficient cause because ‘to be so it would have to exist prior to itself.’ Of all the efficient causes we see in the world there is always a first efficient cause. Without the first, the intermediate efficient causes would not exist, meaning there would be no effect. There must, therefore, be a first cause of everything because, without this, there would be no effect and no world. The first efficient cause is God. There are several criticisms of this argument by the likes of David Hume, Bertrand Russell, J.L.Mackie and Immanuel Kant. 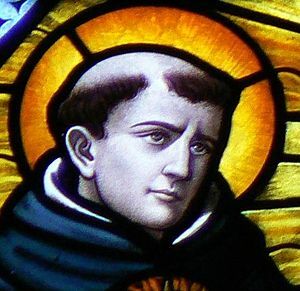 Aquinas is arguing that all things in the world have efficient causes, for all of which we can perceive a first. He thus postulates that there must be a first efficient cause of the whole. However, the very moment he posits this, surely the initially-perceived ‘first efficient causes’ within the world become intermediate causes, following on from the first efficient cause of God. Thus Aquinas’ premise becomes baseless. I am sure that this argument has either already been put forward (the pitfall of living in the 21st century when originality is dead- even that bloody quote is becoming a cliché now) or is rather misguided. Nevertheless, I thought I would share. Night night, you terribly confusing world.